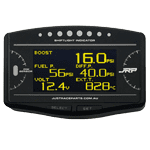 In this section you will find our range of innovative automotive digital multi gauge systems for your performance car, be it for street use or you are a weekend warrior at the track. These systems below will display almost every single aspect of your engine you need to monitor, from Oil & Water temp, to Oil & Fuel Pressure, Boost, EGT, Air Fuel ratios. The huge leaps forward in technology over the past 10-years has meant these kind of LCD digital multi gauge systems for cars could be developed and also brought to market at a price point all enthusiasts can afford. They can display everything in one place rather than having tons of individual gauges throughout the car. A perfect example of this is our digital multi gauge system, pretty much everything you need to monitor on your performance vehicle on a single compact LCD display at a price that wont break the bank. And the 14point7 iDash, another unique yet powerful multi gauge solution that can utilize your existing phones / tablets to display a cluster of multiple sensor readouts. If space is limited in your car and you don’t want 5 or more gauges, but you want to monitor your engine vitals, these digital LCD multi gauge solutions are a great option and at great prices. Each of them is unique in how they deliver multiple sensor readings, but you can rely on the quality of their readings and get on with enjoying your car without the worry of not knowing what’s actually happening inside your engine bay. Here we have the most popular screen / gauge to pair with the multi gauge base unit & sensor package.. Here we have a mini cannon style warning light that is used in conjunction with the 14in1 multi gaug.. Here we have the heart and soul of a multi gauge system for your performance car, this is the base p..